Nickelodeon Italy (Italia) treats viewers to a spooky stop-motion special with the premiere of SpongeBob SquarePants: The Legend of Boo-Kini Bottom on Tuesday 31st October 2017 at 20:00! Locally titled Le spaventose leggende di Bikini Bottom, Nick's new Halloween special tells the story of the Flying Dutchman coming to Bikini Bottom to make sure everyone in town is scared--especially SpongeBob, who seems to be unflappable in his belief that spooky things are actually funny. 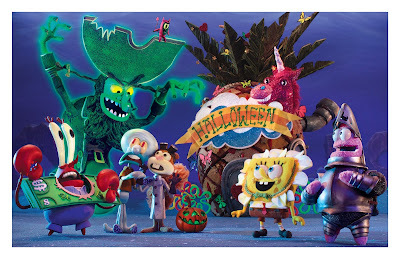 Inspired by the visual style of classic stop-motion animation TV specials, Bikini Bottom is decked out for Halloween and features Sandy's treedome as a mad scientist's lab, including a giant remotely operated Acorn Monster; Mr. Krabs' restaurant as "The Horrors of the Chum Bucket," displaying scenes of Plankton torturing food; and Plankton's restaurant as "The Horrors of the Krusty Krab," telling the story of Mr. Krabs turning customers into Krabby Patties and more. The characters wear Halloween costumes, with SpongeBob as a flower, Patrick as a knight, Sandy as a mad scientist, Mr. Krabs as a dollar bill, Plankton as a devil, Squidward as himself, and Karen as a cat. SpongeBob SquarePants: The Legend of Boo-Kini Bottom features an original song, "The Scare Song," written by Mr. Lawrence, music by Eban Schletter and performed by the Flying Dutchman's crew of pirate ghosts. The Legend of Boo-Kini Bottom was produced at Screen Novelties, a Los Angeles-based stop-motion animation production company, where miniature puppets and sets brought Bikini Bottom to life in three dimensions. The production featured 27 unique sets, across five stages, where 15 boxes of breakfast cereal were used to create texture on Bikini Bottom's coral reefs; eight pounds of glitter were used to decorate SpongeBob's Halloween pineapple house; hundreds of popsicle sticks created the planks of the rollercoaster track that Patrick and SpongeBob ride; and "black lights" were used to create a fluorescent glow across the puppets and sets. This is the second time Nickelodeon has partnered with Screen Novelties on a SpongeBob SquarePants stop-motion episode. SpongeBob SquarePants: It's a SpongeBob Christmas! debuted December 2012 and featured Plankton turning everybody in Bikini Bottom from nice to naughty. Viewers can visit the SpongeBob SquarePants page on NickTV.it, along with the SpongeBob Facebook page and SpongeBob Instagram, to get an exclusive look at the series. SpongeBob SquarePants: The Legend of Boo-Kini Bottom made its world debut on Nickelodeon USA on Friday 13th October 2017 at 7:00pm (ET/PT), and is currently rolling out on Nickelodeon channels and programming blocks globally. In the US-English dub of SpongeBob SquarePants, SpongeBob SquarePants is voiced by Tom Kenny as SpongeBob SquarePants, an incurably optimistic sea sponge who lives in a pineapple under the sea; Bill Fagerbakke as Patrick Star, SpongeBob's silly best friend; Roger Bumpass as Squidward, an aloof cashier of The Krusty Krab and SpongeBob's neighbor; Clancy Brown as Mr. Krabs, SpongeBob's boss and greedy owner of The Krusty Krab; Carolyn Lawrence as Sandy Cheeks, Bikini Bottom's only resident rodent aquanaut and scientist; Mr. Lawrence as Plankton, owner of the Chum Bucket and chief rival of Mr. Krabs; and Brian Doyle-Murray as the Flying Dutchman, Bikini Bottom's resident unfriendly ghost. SpongeBob SquarePants is executive produced by creator Stephen Hillenburg, who previously worked as a writer, director and creative director on Nickelodeon's animated series Rocko's Modern Life. Hillenburg graduated from the California Institute of the Arts with a master's degree in experimental animation and his undergraduate degree, from Humboldt State University, was in natural science with an emphasis in marine biology. Hillenburg executive produced his first feature film, The SpongeBob SquarePants Movie, which debuted Nov. 19, 2004 and his second theatrical, The SpongeBob Movie: Sponge Out of Water, hit theaters Feb. 6, 2015. The series is produced at Nickelodeon in Burbank. More Nick: Nickelodeon Italy To Premiere 'Escape from Mr. Lemoncello's Library' On Wednesday 8th November 2017! Follow NickALive! on Twitter, Tumblr, Google+, via RSS, on Instagram, and/or Facebook for the latest Halloween on Nickelodeon Italy and SpongeBob SquarePants News and Highlights!